TT-P-645B(SH) is a zinc-molybdate primer intended for use as a corrosion inhibiting primer on metal surfaces, particularly in marine service, including vessels (both interior and exterior), offshore platforms, and coastal structures. It may be applied by brush or spray, and is suitable as an after-blast or after-pickling; primer for plating, as an undercoat for alkyd enamels, and for equipment where a quick-drying primer is not required. The basic formulation (Formula 84) provides a primer of yellow color. This primer is formulated to comply with air pollution regulations which allow a VOC of 340 grams per liter (2.8 pounds per gallon). This reference site for TT-P-645 is provided as a courtesy by STIC-ADHESIVE Products Co., a manufacturer of this mil-spec coating. This specification is approved by the Commissioner, Federal Supply Service, General Services Administration, for the use of all Federal agencies. 1.1 Scope. This specification covers a 2.8 pound per gallon (340 gram/ liter) volatile organic content (VOC) complying, zinc-molybdate paint for use as a general primer for application to steel and aluminum (see 6.1). Product is to be used as delivered. TT-R-266 - Resin, Alkyd; Solutions. TT-T-291 - Thinner, Paint, Mineral Spirits, Regular and Odorless. PPP-F-320 - Fiberboard; Corrugated and Solid, Sheet Stock (Container Grade), and Cut Shapes. PPP-P-1892 - Paint, Varnish, Lacquer, and Related Materials; Packaging, Packing, and Marking of. FED-STD-141 - Paint, Varnish, Lacquer, and Related Materials; Methods of Inspection, Sampling, and Testing. FED-STD-313 - Material Safety Data, Transportation Data and Disposal Data for Hazardous Materials Furnished to Government Activities. 40 CFR CH.1, Part 60, Appendix A, Method 24 - Determination of Volatile Matter Content, Water Content, Density, Volume Solids and Weight Solids of Surface Coatings. 29 CFR Parts 1910, 1915, 1917, 1918, 1926 and 1928 - Hazard Communication Act, Final Rule. 2.2 Other publications. The following documents form a part of this specification to the extent specified herein. Unless a specific issue is identified, the issue in effect on date of invitation for bids or request for proposal shall apply. D 869 - Standard Method of Evaluating Degree of Settling of Paint. D 1296 - Standard Test Method for Odor of Volatile Solvents and Diluents. D 1308 - Standard Test Method for Effect of Household Chemicals on Clear and Pigmented Organic Finishes. D 1394 - Standard Test Methods for Chemical Analysis of White Titanium Pigments. D 1475 - Standard Test Method for Density of Paint, Varnish, Lacquer, and Related Products. D 1849 - Standard Test Method for Package Stability of Paint. D 2369 - Standard Test Method for Volatile Content of Coatings. (DoD adopted). D 3335 - Standard Test for Low Concentrations of Lead Cadmium and Cobalt in Paint by Atomic Absorption Spectroscopy. D 3363 - Standard Test Method for Film Hardness by Pencil Test. E 11 - Standard Specification for Wire-Cloth Sieves for Testing Purposes. F 718 - Standard Shipbuilders and Marine Paints and Coatings Product/Procedure Data Sheet. 2.3 Order of precedence. In the event of a conflict between the text of this document and the references cited herein, the text of this document takes precedence. Nothing in this document, however, supersedes applicable laws and regulations unless a specific exemption has been obtained. 3.1 Formula. Zinc-molybdate primer shall consist of ingredients conforming to the requirements of the applicable specifications in the proportions shown in table I (see 6.4.1). TABLE I. Formula number 84. 1/ Molywhite 101, Sherwin Williams Chemicals, 501 Murray Road, Cincinnati, OH 45217, or equal. 3/ NS-720, Cabot "CAB-O-SIL' Division, P.O. Box 188, Tuscola, IL 61959, or equal. 4/ Cyperfil 325, Cyprus Industrial Minerals Company, Box 3419, Englewood, CO 80155, or equal. 5/ Light Yellow Pigment 8G, Mobay Chemical Corp., Mobay Road, Pittsburgh, PA 15205, or equal. 6/ Busperse 47, Buckman Laboratories, Inc., Memphis, TN, or equal. 7/ Cargil 5070, Cargill Incorporated, P.O. Box 9300, Minneapolis, MN 55440, or equal. 8/ Nuodex, Incorporated, Trumen Place, P.O. Box 365, Piscataway, NJ 08854, or equal. 3.1.1 Formula number 84. The formula shown in table I is designated formula number 84. When formula number 84 is specified, or when this specification is referenced without reference to formula number, the primer shall conform to the requirements of this specification. 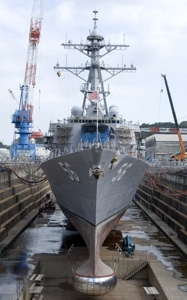 Manufacturers may substitute equivalent materials in the formulation, but shall demonstrate equivalency by performance tests specified by the Naval Sea Systems Command (NAVSEA) (and carried out at a laboratory approved by NAVSEA) and have the alternate formulation approved. Small amounts of antisettling and antiskinning agents may be added to meet the requirements specified in 3.1.2 and 3.3.6, provided all other requirements of this specification are met, and the exact formula used is included in method 1031 of FED-STD-141. 3.1.2 Manufacture. The component raw materials shall be mixed and ground as required to produce a product which is uniform, free from grit, entirely suitable for the purpose intended, and in full conformance to the requirements of this specification. 3.2 Quantitative requirements. The primer shall conform to the quantitative requirements in table II (see 4.3). 3.3 Qualitative requirements. The primer shall conform to the qualitative requirements specified in 3.3.1 through 3.3.12. 3.3.1 Odor. The odor shall be characteristic of the volatiles permitted when tested as specified in table III. 3.3.2 Color. The color shall be an approximate match to color chip number 33793 of FED-STD-595. 3.3.3 Flexibility. The primer shall show no evidence of cracking or flaking when subjected to the flexibility test specified in 4.3.3. 3.3.4 Rosin and resin derivatives. Rosin and resin derivatives shall not be present when the primer is tested as specified in 4.3.4. 3.3.5 Compatibility with thinner. There shall be no evidence of incompatibility of any of the ingredients of the primer (see 4.3.5). 3.3.6 Condition in container. The product shall be readily broken up with a paddle to a smooth uniform consistency, and shall not show any objectionable properties for at least 1 year after date of manufacture (see 4.3.6). 3.3.7 Storage stability. The primer shall show no livering, curdling, hard caking, or gummy sediment after aging in a partially filled container at an elevated temperature (see 4.3.7). After such aging, it shall mix readily to a smooth, uniform state, and any skin formed shall be easily removed. 3.3.8 Dilution stability. The primer shall remain stable and uniform when thinned a maximum of 10%,showing no precipitation, curdling, or separation (see table III). Slight pigment settling is permitted. Any thinning shall not cause the primer to exceed the maximum allowed VOC limits. 3.3.9 Brushing properties. The primer shall brush satisfactorily in all respects and shall dry to a smooth, uniform film, free from seeds, runs, sags, and streaks (see table III). 3.3.10 Spraying properties. The primer shall spray satisfactorily in all respects and shall show no running, sagging, streaking, or pronounced orange peel (see table III). The air-dried film shall show no seeding, dusting, floating, fogging, mottling, hazing, or other film defect. 3.3.11 Knife test. A 0.001 inch (nominal) dry film of primer, prepared as specified in FED-STD-141, method 6304.1, shall adhere tightly to and shall not flake or crack from the metal (see table III). The cut shall show beveled edges. 3.3.12 Water resistance and film hardness. A film of primer, prepared and tested as specified in table III, shall show no wrinkling or blistering immediately after removal of the panel from water. The primer shall have a hardness of 4H when tested in accordance with 4.3.8. After 24 hours air drying, the portion of the panel which was immersed shall also have a hardness of 4H when tested in accordance with 4.3.8. 3.4 Material safety data sheet (MSDS). The contracting activity shall be provided a material safety data sheet at the time of contract award. The MSDS shall be provided in accordance with the requirements of FED-STD-313. The MSDS shall be included with each shipment of the material covered by this specification (see 6.5). 2. A statement of the ratio of volatile content to solids expressed as grams of volatile organic hazardous air pollutants (VOHAPS) per liter of solids. 3.5 Directions for use. The manufacturer shall provide written directions on each container or the mixing and applying of the primer supplied and this direction shall include all information necessary to comply with OSHA Hazard Communication Act and FED-STD-313. In addition, the manufacturer shall prepare an ASTM F 718 data sheet which shall separately detail requirements for small unit (pint, quart, gallon) and large unit (five gallon) containers (see 6.5). 4.1 Responsibility for inspection. Unless otherwise specified in the contract or purchase order, the contractor is responsible for the performance of all inspection requirements (examinations and tests) as specified herein. Except as otherwise specified in the contract or purchase order, the contractor may use his own or any other facilities suitable for the performance of the inspection requirements specified herein, unless disapproved by the Government. The Government reserves the right to perform any of the inspections set forth in the specification where such inspections are deemed necessary to ensure supplies and services conform to prescribed requirements. 4.1.1 Responsibility for compliance. All items shall meet all requirements of sections 3 and 5. The inspection set forth in this specification shall become a part of the contractor's overall inspection system or quality program. The absence of any inspection requirements in the specification shall not relieve the contractor of the responsibility of ensuring that all products or supplies submitted to the Government for acceptance comply with all requirements of the contract. Sampling inspection, as part of the manufacturing operations, is an acceptable practice to ascertain conformance to requirements, however, this does not authorize submission of known defective material, either indicated or actual, nor does it commit the Government to accept defective material. 4.2 Quality conformance inspection. Quality conformance inspection shall be conducted in accordance with methods 1011, 1022, and 1031 of FED-STD-141, and shall consist of the tests specified in table III and 4.3.1 through 4.3.9. 1/ Test in accordance with 4.3.10. 4.3.2 Drying time. Drying time shall be determined in accordance with method 4061.2 of FED-STD-141, except that the specified conditions of temperature and humidity shall apply only for referee tests in case of dispute. All other tests shall be conducted under prevailing laboratory conditions. 4.3.3 Flexibility. Flexibility shall be determined in accordance with method 6221 of FED-STD-141. The primer shall be applied to a flat tin plate panel of approximately 31 gauge by means of a doctor blade capable of yielding a dry film thickness of 0.0010 + 0.0003 inch. The panel shall be allowed to air-dry for 2 hours, then baked for 24 hours at 100 to 105 degrees Celsius (°C). The panel shall then be removed from the oven and allowed to stand for 30 minutes at 25°C. The panel shall then be bent over a 1/8-inch mandrel and the film examined at the bend under a magnification of five diameters. 4.3.4 Rosin and resin derivatives. The test for rosin and resin derivatives shall be in accordance with ASTM D 1542. A portion of the separated volatile vehicle shall be used for the test. 4.3.5 Dilution stability. Dilution stability with thinner shall be determined in accordance with method 4203.1 of FED-STD-141. Fifty mL of primer and 50 mL of paint thinner conforming to grade 1 of TT-T-291 shall be used. Observations shall be made immediately after mixing and 30 minutes after mixing. 4.3.6 Condition in container. The stored sample shall be heated slightly to 73 ±2 degrees Fahrenheit (°F) (23 ±2°C). Evidence of pressure or vacuum in the unopened container shall be noted. The container shall then be opened and examined for evidence of skinning, corrosion of container interior, odor of putrefaction, rancidity or souring. If the sample is in a 1-quart (1-liter) or smaller container, the character of the lower (or settled) lager shall be determined with a spatula as specified in ASTM D 869. If the sample is larger than 1 quart, this step shall be omitted. The paint shall be hand-stirred 300 stirs in 2 minutes with a spatula appropriate to the container, stirring so as to ensure uniform distribution of any settled material. Immediately after stirring, the consistency of the paint shall be measured, using the Krebs-Stormer viscometer. The stored pant shall be applied to a test panel, and after it has dried, the paint film shall be examined for grains 1/32-inch (0.8 millimeter (mm)) in diameter, even larger gelatinous lumps, and streaks caused by such grains or lumps. 4.3.7 Storage stability. Storage stability shall be tested in accordance with ASTM D 1849. A 1-quart can shall be filled approximately three-quarters full of the test specimen paint, closed tightly with a lid, and placed inside a 1-gallon container which shall also be sealed. The sample shall be weighed and stored for 1 month at 125 ± 2°F (52 ±1°C), which will simulate some of the effects of storage for 6 months to 1 year at 73 ±3.5°F (23 ±2°C). At the end of the storage period, the sample shall be conditioned to 73 ±3.5°F (23 ±2°C) and weighed (without shaking) to determine if there has been a loss of weight through faulty closure. The can shall then be opened and the contents examined for skinning, corrosion, and odor of putrefaction, rancidity, or souring. Carry out the rest of the test specified in ASTM D 1849 as specified. 4.3.8 Water resistance. Spray apply a 0.003 inch (±0.001 inch) film of the primer on an abrasive blast cleaned steel test panel. Cure at room temperature (approximately 73°F) for 48 hours. Immerse 50% of the panel in room temperature distilled water for 24 hours. Test for requirements to 3.3.12. The coated panel shall be placed on a firm horizontal surface. A set of calibrated drawing leads or equivalent calibrated wood pencils meeting the following hardness scale (6B-5B-4B-3B-B-HB-F-H-2H-3H-4H-5H-6H) shall be used in the test. Whichever pencil is used, it shall be held firmly against the film at a 45-degree angle (point away from the operator) and pushed away from the operator in a 1/4-inch (6.5-mm) stroke. The process shall be started with the hardest pencil and continued down the scale of hardness to either of two end points, the pencil that will not cut into or gouge the film (pencil hardness), or the pencil that will not scratch the film (scratch hardness). 4.3.9.1 Molybdenum. Molybdenum (Mo) content shall be tested in accordance with the following methods, as applicable: FED-STD-141, method 4021.1; and as specified in 4.3.9.1.1 through 4.3.9.1.7. 4.3.9.1.1 General discussion of interference control. Since calcium interferes with the determination of molybdenum in the nitrous oxide flame, the addition of 2 percent ammonium chloride (NH4C1) has been included as a means of controlling these interferences, in case there should be any calcium present. Additional interferences have been found but have not yet been identified. In order to eliminate the interference, molybdenum content shall be determined by a standard addition method, as specified in 4.3.9.1 through 4.3.9.1.7. (a) An atomic absorption spectrophotometer. (b) A molybdenum hollow cathode lamp. and make acid with concentrated nitric acid (HNO3). Cool. Transfer to a 1-liter volumetric flask and dilute to the mark with distilled water (H2O). (b) Number 2 Mo solution (1 mL = 0.1 mg Mo) - Dilute 100 mL of Mo solution no. 1 to 1000 mL with H2O. (c) Number 3 NH4C1 (10 percent) - Dissolve 100 grams of reagent grade NH4C1 in about 500 mL H2O. Transfer to a 1-liter volumetric flask and dilute to the mark with distilled water (H2O). (a) Weigh 2.000 grams of pigment, which has been separated in accordance with FED-STD-141, method 4021.1, into a 150-mL beaker. Add approximately 50 mL H2O. (c) Filter through a no. 42 Whatman filter paper. Wash well with H2O. Transfer filtrate to a 500-mL volumetric flask. Dilute to the mark with H2O. (d) Prepare three 100-mL volumetric flasks and add as follows: (1) Flask number 0 - Five mL of sample solution above, 0 mL of stock solution number 2, 20 mL of stock solution number 3, and dilute to mark with H2O. (2) Flask number 1 - Five mL of sample solution above, 5 mL of stock solution number 1, 20 mL of stock solution number 2, and dilute to mark with H2O. (3) Flask number 2 - Five mL of sample solution above, 10 mL of stock solution number 2, 20 mL of stock solution number 3, and dilute to mark with distilled water (H2O). (a) Make the necessary balancing and zero adjustments, according to the particular instrument. (b) Run the samples in flasks 0, 1, and 2 and record their absorption or absorbance. (c) Plot the absorbance values versus the Mo concentration (micrograms ( g) Mo/mL) on graph paper. Draw the straight line through the points, extending on to the concentration axis. (d) Determine from the graph the g Mo/mL in the sample. 4.3.9.2 Titanium dioxide. The pigment analysis for titanium dioxide content shall be conducted as follows. Weigh 0.400 gram (g) of the extracted pigment into a 250-mL beaker. Add 25 ml of 1:1 hydrochloric acid and warm on steam bath for 15 minutes. Add some paper pulp (prepared by shaking ashless filter paper in distilled water until the paper is completely disintegrated) to the beaker, and filter on a close-grained paper. Transfer residue quantitatively to the filter paper and wash thoroughly with hot water. Transfer paper to a porcelain crucible and ash at a moderate heat until all carbon has been removed. Return ignited residue to a 250-mL beaker. Add 15 g of ammonium sulfate and 20 mL of concentrated sulfuric acid. Heat strongly until complete solution of titanium dioxide has been effected. Proceed with the remainder of the chemical analysis as specified in ASTM D 1394. 4.3.10 Volatile organic content (VOC). VOC shall be determined in accordance with 40 CFR CH. 1, Part 60, Appendix A, (U.S. EPA) method 24 and checked for compliance with 3.1 and table II. Contractor shall file certification of VOC compliance (see table II). 4.4 Inspection of packaging. Sample packages and packs, and the inspection of the preservation, packing and marking for shipment, stowage and storage shall be in accordance with the requirements of section 5 and the documents specified therein. 5.1 Packaging. For acquisition purposes, the packaging requirements shall be as specified in the contract or order (see 6.2). When actual packaging of materiel is to be performed by DoD personnel, these personnel need to contact the responsible packaging activity to ascertain requisite packaging requirements. Packaging requirements are maintained by the Inventory Control Point's packaging activity within the Military Department or Defense Agency, or within the Military Department's System Command. Packaging data retrieval is available from the managing Military Department's or Defense Agency's automated packaging files, CD-ROM products, or by contacting the responsible packaging activity. 5.2 Material safety data sheet. DELETED. 6.1 Intended use. Zinc-molybdate primer covered by this specification is intended for use as a corrosion inhibiting primer on metal surfaces, particularly in marine service. It may be applied by brush or spray, and is suitable as an after-blast or after-pickling; primer for plating, as an undercoat for alkyd enamels, and for equipment where a quick-drying primer is not required. The basic formulation provides a primer of yellow color. This primer is formulated to comply with air pollution regulations which allow a VOC of 340 grams per liter (2.8 pounds per gallon). The product contains 340 grams per liter, as delivered, and must not be thinned. (a) Title, number, and date of this specification. (b) Size of container, if other than required (see 5.1). (c) Levels of packaging and packing required (see 5.1). (d) Packaging acquisition options (see 5.1). (e) Size of cans or pails (see 5.1). (f) Whether fire-retardant wood containers are required (see 5.1). (g) Marking requirements (see 5.1). 6.3 Special considerations for alkyd resin solution. If alkyd resin solution conforming to type I, class B of TT-R-266 is used, the weight of the alkyd resin solution, as specified in this specification, should be multiplied by 1.17, and the paint thinner, mineral spirits (grade 1), should be reduced by 0.17 times the weight of alkyd resin solution. 6.4 Information regarding table I. 6.4.1 Allowance for manufacturing losses. The formula shown in table I is based on 102 gallons (approximately) to allow for normal manufacturing loss. 6.4.2 Reference of commercial products. Notes for table I indicate commercial products that are of appropriate quality. These products are listed as examples only and their presence in this specification is not to be considered an endorsement of any kind. 6.5 Material safety data sheet (MSDS, ASTM F 718 and Hazard Communication Act Documents. Contracting officers must identify those activities requiring copies of documents. Additional required Government MSDS information is contained in FED-STD-313. In order to obtain the MSDS, FAR clause 52.223-3 must be in the contract. 6.6 Color chip sample. A dry color chip for primer formula number 84 may be obtained from the General Services Administration (GSA). 6.7 Sub-contracted material and parts. The packaging requirements of referenced documents listed in section 2 do not apply when material and parts are acquired by the contractor for incorporation into the equipment and lose their separate identity when the equipment is shipped. 6.8 Packaging recommendations. Suggested packaging requirements are contained in Tables IV and V.
Containers (1) The coating should be specified to be furnished in cans capable of holding 0.47 liters (L) (1-pint), 0.945L (1-quart), 3.78L (1-gallon) and 18.9L (5 gallons). (2) Multiple friction plug containers should be in accordance with PPP-C-96, Type V, Class 2. Interior coatings should be as specified therein. Exterior coatings, including side seam stripping, should be as specified therein for plan B. Wire handles as specified therein, should be provided for the 1-gallon container. Closure of the properly filled and sealed cans should be as specified in the appendix thereto. (3) All containers should comply with the requirements of the Uniform Freight Classifications (UFC), the National Motor Freight Classification (NMFC), and the applicable requirements of the Code of Federal Regulations 49CFR, Department of Transportation (DOT). (4) Unit of procurement: The paints covered by this specification should be purchased by volume. The unit of procurement should be in multiples of 1 L or 1 U.S. liquid gallon at 15.5°C (60°F). Commercial packaging (1) Commercial packaging should be to ASTM D3951. (2) All containers should comply with the requirements of the Uniform Freight Classifications (UFC), the National Motor Freight Classification (NMFC), and the applicable requirements of the Code of Federal Regulations 49CFR, Department of Transportation (DOT). (1) Overseas delivery packing. Intermediate containers of like size cans of paint should be packed in close-fitting wood boxes conforming to PPP-B-601, overseas type, or PPP-B-621, class 2. Box closure and strapping should be as specified in the applicable box specification or the appendix thereto except that strapping should be flat and the finish B. (2) Domestic delivery (Level B) packing. Level B packing should be as for level A, except that boxes should be domestic type or class and the strapping should be finish A or B. (3) Commercial packing. The paint, in the unit and intermediate containers should, as applicable, be packed in multiples of like sizes in accordance with UFC, NMFC and 49CFR requirements. Palletization Intermediate containers should be palletized in accordance with MIL-STD-147. Only one size unit or intermediate container should be placed on a pallet. Intermediate containers Paints should be packaged in intermediate containers as cans. Intermediate containers should be close-fitting corrugated fiberboard boxes in accordance with UFC, NMFC and 49CFR requirements. Fiberboard used in the construction of interior (unit and intermediate) and exterior containers, including interior packaging forms, should conform to the PPP-F-320. PPP-F-320 classes should be domestic fire-retardant or weather resistant fire-retardant (see 6.2). MIL-L-19140, Type II, Category I.
MIL-L-19140, Type I, Category I. Material safety data sheets (MSDS) and product/procedure data sheets A copy of the MSDS and company product data/procedure sheets should be attached to the shipping document for each destination (see 6.4). VOC certification sheets VOC Certification sheets will be provided by the manufacturer for each batch of the coating system when requested by the procuring activity. Hazardous warnings (a) Labels should be in accordance with 29 CFR Parts 1910, 1915, 1917, 1918, 1926 and 1928, as well as PPP-P-1892. "CAUTION: This paint contains volatile solvents, with probable hazardous vapors. Use with adequate ventilation. Avoid prolonged breathing of vapors or spray mists. The solvents are highly flammable, avoid open flame and smoking." (c) Each component container, shipping container, and palletized load should be marked with the appropriate hazardous symbol. (d) Unit containers should be marked: "This product is Lead free, except for possible trace levels." Volatile organic content (VOC) "Contains (insert VOC content) grams per liter (insert VOC content in lb/gal) of volatile organic content per 40 CFR 60, Appendix A (EPA) Method 24." Hazardous air pollutants "Contains [insert HAP content here in g/L and lb/gal] solids (nonvolatiles) per 40 CFR 63." Shelf life Each unit container, intermediate container where applicable, and shipping container should be marked as follows: "Date of first re-inspection (insert here date 2 years after date of manufacture)." 6.9 Subject term (key word) listing. 6.10 Amendment notations. The margins of this specification are marked with vertical lines (ed. not reflected in HTML version) to indicate modifications generated by this amendment. This was done as a convenience only and the Government assumes no liability whatsoever for any inaccuracies in these notations. Bidders and contractors are cautioned to evaluate the requirements of this document based on the entire content irrespective of the marginal notations. NOTE: The activities listed above were interested in this document as of the date of this document. Since organizations and responsibilities can change, you should verify the currency of the information above using the ASSIST Online database at http://assist.daps.dla.mil. Beneficial comments, recommendations, additions, deletions, clarifications, etc. and any data that may improve this document should be sent to: Commander, Naval Sea Systems Command, ATTN: SEA 05Q, 1333 Isaac Hull Avenue, SE, Stop 5160, Washington Navy Yard DC 20376-5160 or emailed to CommandStandards@navy.mil, with the subject line "Document Comment". Since contact information can change, you may want to verify the currency of this address information using the ASSIST Online database at http://assist.daps.dla.mil. These external resources provide additional information about TT-P-645B and its applications.